As you travel, let the world know you stand with the Justice League: Wonder Woman, Batman, Superman, Aquaman, Cyborg, and the Flash. 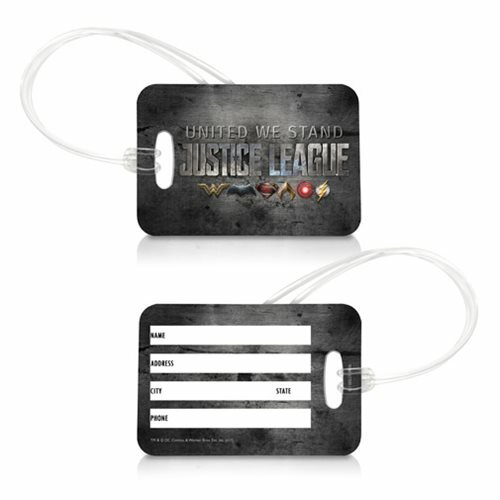 Their DC Extended Universe logos appear side-by-side on this tough looking 4-inch wide x 2 3/4-inch tall Justice League United We Stand Logo Luggage Tag. Fiberglass reinforced plastic makes it almost as durable as the heroes it displays! Use it as a luggage tag, keychain, or zipper pull… and no one will blame you if you pretend this is your League membership card. Clear vinyl attachment string included.